135 b/w illus. 9 colour illus. Lorenzo de'Medici was a passionate collector of objects from antiquity and the post-antiquity period as well as an important patron of the arts in fifteenth-century Florence. His activities as a collector are documented in a group of 173 previously unknown letters included in this volume. As revealed in these letters, Lorenzo had a preference for small objects: coins, hardstone vases, and gems. This book reveals how such objects were studied, displayed, selected and valued by de'Medici and other collectors during this period. 1. The first period of collecting: 1465–1483; 2. The second period of collecting and Lorenzo's sources: 1484–1492; 3. Behavior in the art market; 4. The objects collected; 5. Contemplating the objects; 6. The image of Lorenzo as a collector and antiquarian; 7. The fate of Lorenzo's collection following the French invasion of Florence in 1494; 8. Lorenzo in the context of collecting. 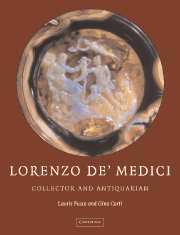 "This important, comprehensive book investigates the collecting activity of Lorenzo de'Medici, among the most important figures of the Italian Renaissance. Based on extensive documentation, including 173 previously unpublished letters transcribed by Corti, it is immediately a standard resource on the subject … With broad interdisciplinary appeal and an exemplary scholarly apparatus of notes, bibliography, documents, and photographs … this book will be indispensable on the subject and is a must for academic libraries."
"A vast and painstakingly researched volume … this out of the ordinary art book is a significant and wise investment … Highly recommended."